Let me start by saying that I’ve always wanted a t-shirt quilt. At one point, I even thought I would take a quilting class just so that I could try to make one on my own. That idea quickly fizzled. 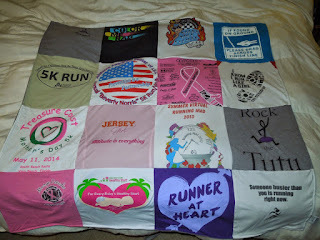 Luckily for me, I recently found an affordable way to have my coveted t-shirt quilt made! While I know that there are plenty of similar businesses out there who can turn your t-shirts into snuggable blankets of memories, if you are in the market for a t-shirt quilt, I urge you to choose Project Repat. The product is remarkable, and I’ll get to that shortly, but it’s truly the organization that is most impressive. The brand name “repat” actually stands for repatriate, which means to return to the country of origin. One of the major goals of this little-engine-that-could organization was to help bring back textile jobs to the United States, while also allowing our citizens to work for a fair wage and full benefits. In addition to this feat, each yard of the PolarTec fleece used for the backs of these blankets is made out of twenty-three recycled plastic bottles. So not only is this company helping with job creation in our country, they are also helping our environment in the process. As for the blanket, what can I say? It is so much better than I thought it would be! It’s soft, comfortable, and the quality is outstanding. I chose to use some of my favorite running shirts to pay homage to my running days. Seeing my racing and training shirts together made me so proud of my accomplishments! The sentimental value of this blanket is priceless, and I couldn’t be more thankful to Project Repat for being so careful with all of my memories. I chose a lap size blanket, which contains 16 panels, in the standard 12x12 panel size. The fleece backing comes in multiple colors such as magenta, red, black, gray and blue. The price for this size is $74.99. There are also twin, full, queen and king sizes available that range from $109.99-$239.99 (if using the standard size panels). I think the prices are really affordable for the quality product that you receive. Not to mention, you are helping a fellow American out by purchasing from Project Repat. These t-shirt quilts make very unique gifts! Please feel free to use my 15% discount code “repatfriend” when ordering yours! As always, thanks for reading! Please go check out the Project Repat web site! Disclaimer: I was provided with a free product in return for my honest review. All thoughts and opinions expressed here are my own and not influenced by the developing company or any of its affiliates.